September 1942. The Kroger warehouse in Pittsburgh, Pennsylvania. "Freight car movements. 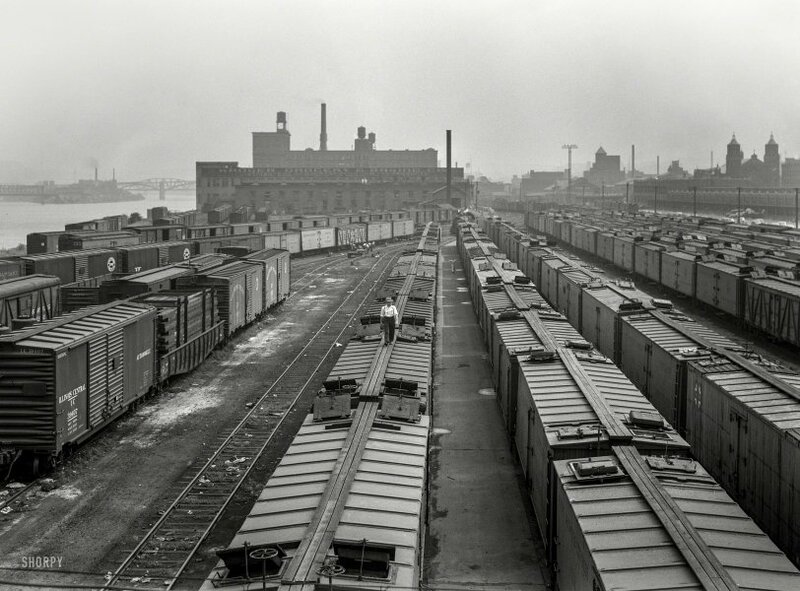 With transportation assuming vast new importance in wartime America, movement of freight cars must be accomplished with the fullest efficiency and speed. Loss and diversion of ocean carriers which served our seaboard cities have thrown an enormous burden upon the railroads." 4x5 inch nitrate negative by Ann Rosener for the Office of War Information. View full size. Submitted by mieczkow on Sun, 12/31/2017 - 8:23pm. Submitted by Wormy on Sat, 12/30/2017 - 5:09pm. But refrigerated box cars. A great detail shot of a "Reefer's" ice hatches. Submitted by DaveA on Fri, 12/29/2017 - 9:28pm. Nearly all of the tracks in the foreground are long gone except for a couple of the old Allegheny Valley RR that ran right down the middle of Railroad Street. The Kroger warehouses are also gone but larger and looming in the distance of the old photo is the still extant twin buildings of the huge Armstrong Cork Co. now turned into loft style living for those wanting an historic pad with a river view in the Steel City. Submitted by scottrodo on Fri, 12/29/2017 - 8:53pm. This looks like the strip as viewed from the 16th Street Bridge. I believe the church on the far right is St. Stanislaus that faces down Smallman Street. Submitted by TheGeezer on Fri, 12/29/2017 - 2:16pm. Are those reefers the walker is inspecting?